Akashic Archives is an exploration of the parallels and contrasts between Indian Tattwa culture and my African/Taíno roots. Symbols and imagery from each tradition are interposed to tell a story of these two cultures’ philosophical and mythological quest to understand the basic, primordial elements of life. Why turn to ancient mythology to make art addressed to a twenty-first century audience? What do these images and ideas have to do with us? It is precisely the urgency of making meaning in our current world that draws me to these ancient configurations. As climate chaos takes an ever greater place in our lives; as natural disasters assail crowded human environments with increasing regularity, our need to exist sustainably in the natural environment becomes ever more pressing. As the question of the survival of the human species looms, the task of making meaning out of the relationship between humans and nature has become not just pressing, but essential. Akashic Archives is meant to offer a visual, spiritual experience of what can be if we attend to seeking and creating. Surely the ideas these ancestors have left us, along with their images of balance and tranquility, have something to teach us. I hope we can learn. Diógenes Ballester call himself an “arteologist”. His recent artistic period, one of developing maturity as a citizen of the world with roots firmly embedded in his Puerto Rican heritage, is influenced by a transnational orientation with particular connections to New York City, Puerto Rico and Paris. 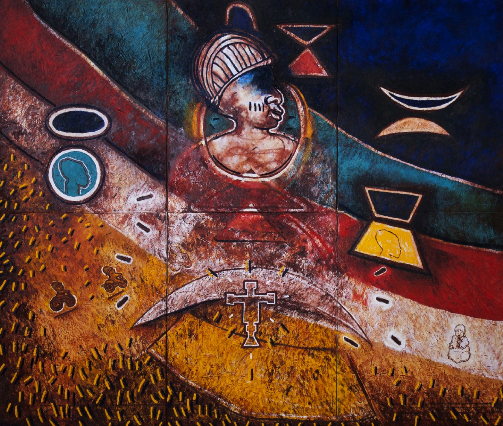 He has received numerous honors for his artistic work and he has exhibited widely in the United States, Europe, Asia, Latin America and the Caribbean. He was Guest of Honor to repersent America at the 2nd International Print Biennal of Guanlan in China in 2009; He won the prize for the Best Exhibition of the Year in the Contemporary Media from The International Association of Art Critics (AICA) of Puerto Rico in 2007; The Prize of Honor in the Category of Drawing, the Tenth International Biennial of Printmaking and Drawing of Taipei of R.O.C. presented at Museum of Fine Arts of Taipei in Taiwan in 2001; and a Gold Medal at The 3rd Biennial of Painting of the Caribbean presented at the Modern Art Museum of Santo Domingo in Dominican Republic in 1996.